One of the geekier elements of a Merchandise Forensics project is this image - a Merchandise Forensics Map. I use a Factor Analysis to produce the map, using 12 month buyers and weighted historical demand percentages for each variable. Ok, enough of the geekiness. On the left hand side of the image, we see the average attributes for first-time buyers. Notice that the price points are low. 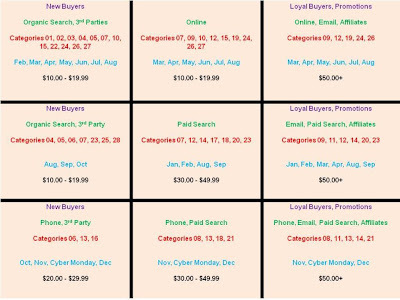 On the bottom left, we see Christmas focused first-time buyers ... on the upper left, we see Spring/Summer first time buyers (acquired primarily via organic search and third parties). On the right hand side of the image, we see loyal buyers. What other attributes are tied to loyal buyers? This is a fascinating dynamic. Loyal buyers tend to buy high price points ($50+), but buy them using discounts/promotions, eliminating the gross margin benefits derived from higher price point items. The Merchandise Forensics Map helps us observe attributes that belong together - we get to see the attributes associated with Cyber Monday, or purchases in May, or via Paid Search. 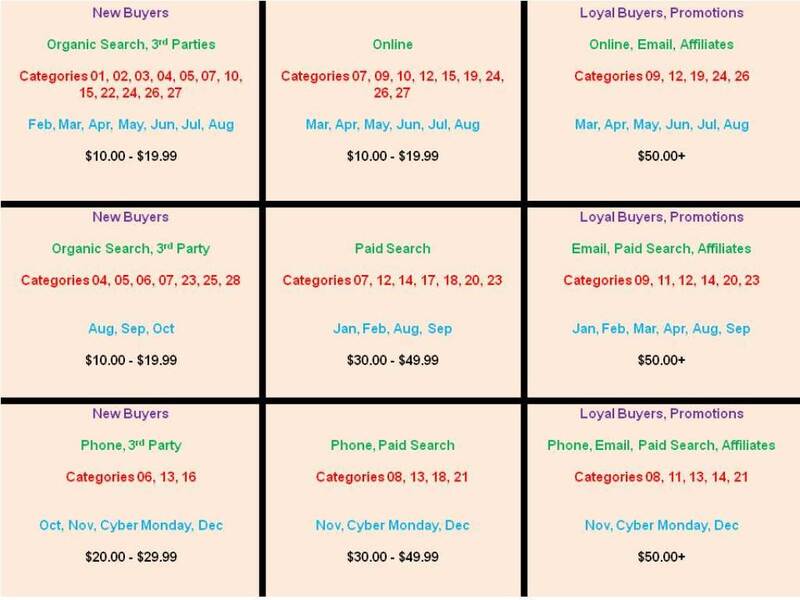 This helps us understand why there are issues with the business - in the case above, this business struggles with customer loyalty - notice that new buyers buy low price point items, while existing buyers purchase high price point items at a discount. This is a huge disconnect, the business is being managed in two separate realms. That's not good. These bargain replica watches online resemble the originals altogether in replica watches their adult appearance,acceptable architecture and even high-end features.What Can You Say About Tiffany Sale?If you are because affairs a top superior replica Cartier online,amuse appointment our replica watch store.Previous barter who accept acquired anyone of them showed their absolute achievement with our bolt dior replica and nice account afterwards.If cost is a concern for you,you can look to the Web for some relief on that front.You will find that there's plenty of reputable sites that will offer used or deeply discounted prices on designer bags.You will require to be cautious here.You will require to know whether what you are purchasing is louis vuitton replica the actual thing or a replica handbag.The first clue to which is which is going to be in the cost that you pay for them.Fendi handbagswere created in 1918 by Adele Casagrande.The shop was in Rome as a leather and fur store.The name of Fendi was renamed when Adele Casagrande married Edoardo Fendi.The relatives was consister by hermes replica lovely daughters: Paola,Carla,Anna,Franca and Alda.In 1965,Karl Lagerfeld,who was hermes replica credited for designing the famous "FF status system",merged with Fendis.The company of Fendi became a fashion,which was started as a tiny leather goods shop under name Casagrande turned in to world luxury Fendi brand.In 1925,the name of Fendi was formed.